MainAll NewsDefense/Security"I should be the next Defense Minister"
Jewish Home Chairman, Education Minister Naftali Bennett, has his own, original plan for dealing with Hamas. 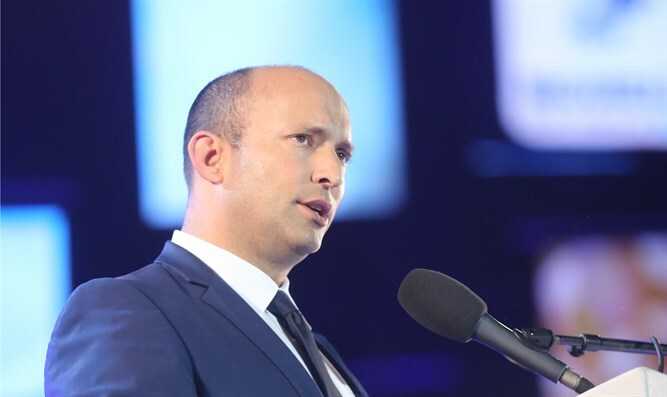 The fires raging along the border with Gaza ignited a small political conflagration as well, this week – with Education Minister Naftali Bennett at its focal point. Bennett has been trying to formulate a thorough solution for the incendiary kite and balloon terror wave. His reportedly tense exchange on this matter with the Chief of Staff – Lt. Gen. Gadi Eizenkot – in the course of a Cabinet meeting, was leaked to the press. The leak itself then became a political issue as well. Bennett is angry about what he calls the "tendentious leaks". "Anyone wishing to silence my viewpoint employs the simplest trick, and leaks," he told us in an exclusive interview for Besheva Magazine. "The leaker had a vested interest and he did something very serious. The person who wanted to leak tried to hurt me and the Chief of Staff but he failed, because the good relations between us are ongoing. Along with several other ministers, we suggested that the Cabinet ministers undergo a voluntary polygraph test, and we await his approval and his instructions. This is a bane that must be cured. I want to be able to conduct a discussion in the Cabinet without being told every minute that I said this or that." Do you really think that the ministers will be willing to undergo a lie detector test? "We announced that we are willing to undergo it, on our own initiative. Whoever does not submit to it – his position is clear. The bottom l ine is that we need to stop the leaks from the Cabinet." Leaks notwithstanding, Bennett is clear on what he thinks needs to be done in Gaza. "There are two approaches here," he explained. "There is the approach that says that since the balloons have not killed anyone to date, it should not be seen as terrorism and it should be contained. I think that these are terrorists and that we need to fire on them and eliminate them. There is also an operational aspect. I said from the get-go that forceful action at the very outset of this terror [wave] would have extinguished the matter before it expanded. If you don't fire at three terror squads, you get a thousand of them – and that is what happened." Bennett believes there is a deeper question at the root of the debate, regarding what constitutes moral behavior. "There is an approach that stems from Western morality, which posits that there needs to be proportionality between what Hamas does to us and what we do to them," he told us. "The Europeans complain that we ended the events at the border fence with 64 [Gazan] dead, and they say that is immoral. I am in total disagreement with this approach. Jewish morality is very clear: 'When someone approaches you in order to kill you – kill him first.' These are terrorists and they need to be eliminated. I find the very question, as regards morality, strange." What do you think needs be done? "I think that this attrition is not the way. We need to work according to a plan for the unilateral demilitarization of Gaza, with a lot of careful planning . I have proposed a plan, which I obviously cannot expose. It embodies a very different approach from the currently accepted one and I am lobbying for it. With the correct action, we can avoid civilian and military casualties, or at least reduce them considerably." Does your plan include the possibility of evacuating residents from the Gaza perimeter for some time? "I am not ruling out any option that can lead to the defeat of Hamas and to the safeguarding of our citizens' lives." Can your plan prevent the need for a military campaign? "I hope that with the correct course of action, we will be able to avoid all-out war. We were mistaken when we initially accepted that incendiary terror, and they understood the restraint as a green light… I will continue to fight for the more aggressive approach, which sees the people flying explosive kites and incendiary balloons as terrorists." "Even now, there is a way to defeat Hamas with sophistication, not necessarily with the standard approach that involves armored divisions entering Gaza. There are other ways." Bennett wants the public to realize that Likud is trying to limit the Jewish Home's influence to a minimum. "In the last two election campaigns, Netanyahu tried to leave us out [of the government], or use us as a fifth wheel with small portfolios. If Netanyahu is able to form a coalition based on right wing and religious parties without us in the future, all of our accomplishments will fade away. That is why we must aspire to be stronger, to aspire toward 15 Knesset seats. Only with many Knesset seats will we be able to continue our work and also to take the Defense portfolio, because it is important that we deal with these subjects, and also place the IDF Civil Administration – which is not functioning properly – under our aegis. You have had meaningful success with the Education portfolio. Don't you want to stay on there? "What we did in the Education Ministry is nothing less than a revolution. If everything were functioning properly in the areas of defense and settlement, I would be very glad to carry on in the Education Ministry, but that is not the case. In order to create a real breakthrough in settlement and defense, I must be the next defense minister of the State of Israel. The right spirit has to be brought back to the defense establishment. The Civil Administration – where the jurists keep interfering with the settlement enterprise – must be dealt with once and for all… To reach one million residents in Judea and Samaria, there is no other way but to hold the Defense portfolio."